Shake with ice. 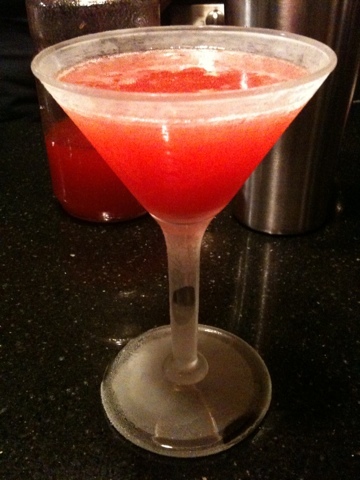 Strain into prepared cocktail glass. Prepare cocktail glass by first freezing glass. 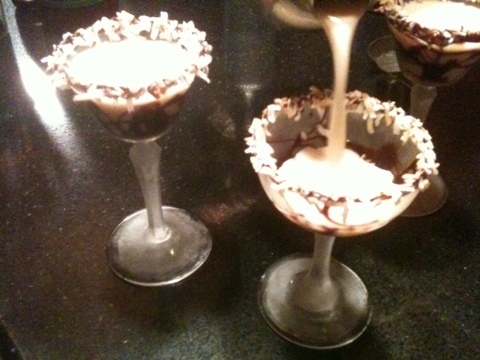 Apply chocolate syrup by twirling glass while holding it at an angle by its stem, then refreezing. Toast shredded coconut on cookie in 350 oven. Remove glass from freezer. Pour additional syrup in a shallow vessel and rim glass with same. Apply shredded coconut to rim of glass. Serve immediately or refreeze. Shake vigorously with ice for at least a minute. Strain into frozen cocktail glass. A fresh strawberry would make a lovely garnish. Strawberry reduction is made from fresh strawberries, water and sugar. I leave it to Joe to tell you his methodology. That Chocolate Covered Strawberry cocktail was sublime if we do say so ourselves.